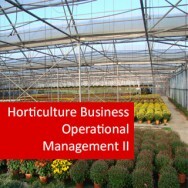 Operational Business Management I (Horticulture)course online. Learn to develop the knowledge necessary to plan for Economic and Marketing Success in a Horticultural Enterprise. 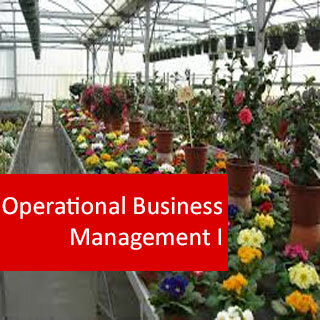 A study focusing on managing Economics, Planning and Marketing of operations in horticulture. Your ability to manage a business can make a huge difference to your success in horticulture. In this course, you will learn to the business side of horticulture, including how to plan and implement effective strategies for your business and/or services. 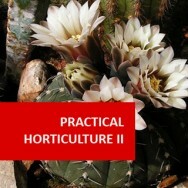 This is a module in the Royal Horticultural Society’s Master of Horticulture. To develop an ability to formulate and evaluate strategy as well as to ensure effective business performance in today's fast changing social, political and economic environment, for horticultural enterprises within one sector of the horticulture industry. A strategy is a route map. It shows you where you want to be and how you intend to get there. It does not tell you how to drive or how to overcome hurdles and obstacles along the way – this is covered in the operational plan. Identify the domain ie. market niche, unique products, etc. Explain your competitive advantage in the said domain. Specify strategic objectives (covered later in course). Outline potential rewards (normally financial). As mentioned earlier, the operational plan tells you how to overcome problems encountered along the route. In other words, it is more a tactical plan. The operational plan is more focused on the day to day activities of the business needed in order to achieve the strategic plan. This tends to include managing resources. A simple Gantt chart helps to illustrate the key steps within the operational plan. You may also write a step by step guide describing each activity. 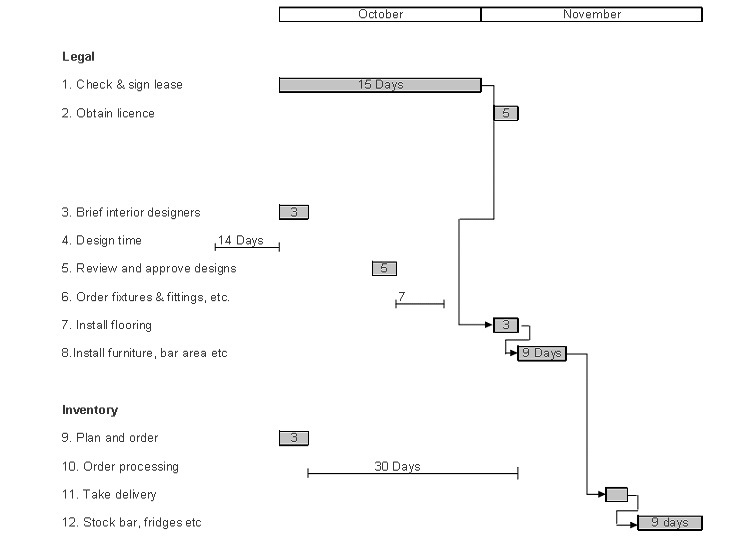 The diagram below illustrates the operational plan in a simple Gantt format for a new bar opening up. The shaded boxes show the time taken per operation. The vertical arrows show the critical path i.e. once the lease has been signed, the floor can be installed without the other operations completed. The Executive Summary – The Executive summary is essentially a miniature business plan. It should summarize all of the significant points of the whole plan in ideally one page. The executive summary sets the tone of the business plan, it can tell the reader what to expect. Infuriatingly, some key decision makers can base finance decisions based on the summary alone, so make sure it’s good! The Main Body – this will become apparent throughout this course. The Conclusion – What is the business building up to? What last impression do you want to leave on the reader’s mind? Business plans are not static they need to be revised and re-developed constantly along with the growth and changing needs of the business. There is a saying that is “nothing is constant except for change” – this is something that needs to be understood in planning for the future. You can make a plan for the future, but it needs to be flexible to incorporate impending changes that most likely will occur. Basic business plans can be used to develop a more targeted plan, when applying for a loan or looking to attract investors. The SWOT (strengths, weaknesses, opportunities and threats) analysis helps the business to identify internal and external factors that may have an affect on your business. Strengths and weaknesses are internal, ie. maintained within the business, factors which you have some control over. Opportunities and threats are external, ie. environmental factors you have no control over. The major outcome of strategic road-mapping and strategic planning, after gathering all necessary information, is the setting of goals for the organization based on its vision and mission statement. A goal is a long-range aim for a specific period. It must be specific and realistic. Long-range goals set through strategic planning are translated into activities that will ensure reaching the goal through operational planning. Many people believe they plan; they consider the future and/or contemplate how they might increase profits. However, merely thinking ahead will not produce either an efficient or an effective plan. Planning is a process that involves the development of goals and objectives, and determining methods or strategies for reaching them. It also involves re-evaluation – making sure that the plan is viable and according correct if not. By setting goals and objectives, you are establishing the outcomes you wish to achieve, first in a broad sense (goals) and then more specifically, in measurable terms (objectives). Maximise profit – this is usually the primary objective of any business in the private sector. Maximise shareholder wealth – This is often presented by the Board of Directors within large PLC’s. 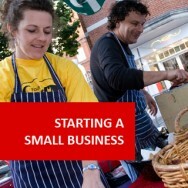 Business growth – this can be in a variety of forms depending on the type and current size of the company. Spreading risk – most often in the form of diversification. The long-term survival of the company can be supported when the company does not rely on one main product. For example, the chocolate manufacturer Cadbury is now Cadbury Rowntree Schweppes as it has diversified into soft drinks and sweets. The anagram of Strengths, Weaknesses, Opportunities and Threats (SWOT) analysis is a strategy development tool that matches internal organizational strengths and weaknesses with external opportunities and threats. SWOT analysis is the key component of strategic development. It can prompt actions and responses to possible struggles in the future. Gap analysis is a way of finding niche markets which can give you a competitive edge. To solve a company's problems, or to fulfil its manager’s growth ambitions, moving into new product and market areas ("diversification") is often the recommended prescription. But diversification has a poor record of success. Most companies (and people) think that they know their own strengths. They do, to a limited extent. But an outsider looking in can often find hidden strengths (and weaknesses). An example of successful Gap Analysis is villa holidays. In the 1970s, package tour companies found a segment of the public who didn't want to organise all of their holidays, but who disliked the regimentation of package tours. Since then, the exploitation of this market gap has revealed other niches, which has resulted in Fly 'n Drive holidays and Fly 'n Camp holidays (with tents provided at the destination). 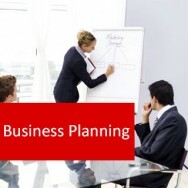 A business strategy is a plan devised in order to allow an organisation to achieve a specific objective. The currently dominant view of strategy is the resource-based theory. Traditional strategy models focus on the company's external competitive environment. They are looking at all the possibilities coming from the outside of the company. Most of them do not attempt to look inside the company. In contrast, the resource-based perspective highlights the need for a fit between the external market context in which a company operates and its internal capabilities. This can also include internal liabilities or places where there are weaknesses to look at within the company. This is a more overall comprehensive view of the company. According to this view, a company's competitive advantage derives from its ability to assemble and exploit an appropriate combination of resources – from both inside and outside the company. Sustainable competitive advantage is achieved by continuously developing existing and creating new resources and capabilities in response to rapidly changing market conditions. The planning should be undertaken regularly and involve an internal audit to appraise the strengths and weaknesses of the firm. And an external audit to evaluate the threats and opportunities in the company’s competitive environment; in other words a SWOT analysis. Are they understood and supported by staff? Are they clearly defined? Is the outcome of each objective measurable so that it will be clear when it has been achieved? Does each objective have a target date for completion in order to ensure action? Are the organisation’s objectives focused excessively on short-term profit maximisation at the expense of the long-term development of the business? Do the managers of the business clearly understand its strengths and weaknesses? Have opportunities in the competitive environment been identified? Does the strategic policy of the organisation match the firm’s strengths to opportunities in the competitive environment?